Arnold Zwicky’s lovely post this morning about baguette and how it’s surprisingly not a diminutive of bague threw me into reminiscing about my time in Paris — 12 years of my life. Instead of continuing to hijack the comment space over there, this is something to pursue on this blog, even though we seem to be averaging a post every year and a half. In particular, there’s the half-remembered anecdote about Jacques Chirac, the former French president, which I’ve now chased up acros the ‘nets. Those crazy French with their over-emphasis on food — ascribing magical qualities to something mundane as bread. 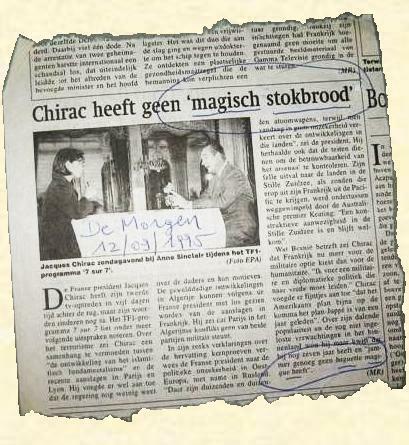 As far as I can tell from trying to find a correct account of this story online, the phrase magisch stokbrood has since become a little bit of a jocular cliché in Dutch and/or Flemish (I do not know if the spelling differs in the two languages), following the rise of the Harry Potter book series. As for the chicken parts, in France chicken legs aren’t usually separated into what in English are called “thighs” and “drumsticks”, and the entire thing — about a meat portion’s worth for a smallish chicken — is referred to as cuisse (“thigh”). I was very happy to find this image in a Belgian blog in Flemish, where I took the liberty to steal it.